There are several loosely-defined terms in the event industry. That is, words that can be interpreted in different ways. The word "event" by itself could mean anything from a birthday party to benefit concert. And the use of different terms can lead to confusion and misunderstandings, specifically around job titles. One of the biggest areas of confusion is around event planners versus event coordinators. Outside of the industry, many people do not understand the difference between an event planner and an event coordinator. Generally speaking, the planner makes the critical decisions regarding the what, when, who and how. 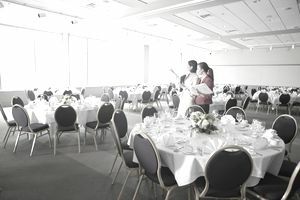 An event coordinator, on the other hand, is responsible for making sure all the details are executed and that each vendor shows up on time and performs appropriately. An event planner works directly with the client to determine the customer's vision, needs, and budget. For example, if it's a wedding, the event planner may discuss the couple's intended tone, the level of formality, and the size of the guest list. From there, the event planner designs an event to wow the client. He or she will choose a venue, type of entertainment and work with the client to determine a menu. They focus on the big-picture items that make an event memorable. Becoming an event planner takes years of experience. A planner carries a lot of responsibility in ensuring the client is happy and designing an event that fits the customer's needs and expectations. Before becoming a planner, several years of working as an event coordinator is often necessary. It's an important stepping stone to a career in events. An event coordinator does not get involved with the design of the event, itself. Instead, they are in charge of managing the individual components to ensure the event goes smoothly. Once the planner has determined the vision for the event, the coordinator assists the planner in making that a reality. They may look at vendors, organize delivery dates, and handle logistical tasks. Larger organizations may have two coordinators for every planner, while smaller operations might only have one coordinator that serves the needs of all executive decision makers. Either way, there is typically a direct line of supervision over the coordinator position. Now that isn't to say event coordinators have it easy. Most of them have the difficult task of organizing everything on-site with only a few hours before the event begins. This, of course, is when most problems occur, which is why a good coordinator is focused, organized and resourceful. This is a great position for those looking to start a career in event planning. Working as a coordinator gives you a strong foundation to move onto an event planner role later in your career. A strong coordinator is worth their weight in gold to any planner, and job security (if you're good at your job) is virtually guaranteed. To break into a career in event coordination, getting an internship or volunteering with a non-profit to help them plan their fundraising events can be advantageous. You'll get hands-on experience in coordinating a real event and build your professional network at the same time.